Tommy Lee Jones returns to the director's chair for The Homesman - a bleak, yet stirring Western drama with a boldly feminist narrative angle and surprising gritty poignancy. The Homesman appears to be something of a passion-project for Jones. With a variety of cinema's finest cropping up for small roles (exemplified in appearances from John Lithgow, James Spader, and Meryl Streep) and Luc Besson's name popping up as producer (Jones uncharacteristically starred in Besson's much-derided The Family in 2013) - it really feels that the actor has had to call in some of his Hollywood pals to get this made. I for one am glad that he did. In the 1850s, good hearted middle-aged spinster Mary Bee Cuddy (Hilary Swank) agrees to transport three mentally ill women across the American Midwest to an Iowa church. Cuddy hires low-life drifter George Briggs (Tommy Lee Jones) to accompany her on this journey. Jones as a director (and one of three screenwriters) has a tight narrative grip, consistently engaging us throughout this two-hour journey. Whilst capturing a bleak melancholy in the sparse Midwestern setting (thanks to the stirring work of cinematographer Rodrigo Prieto), Jones also unleashes some genre familiarity in the form of barren gunfights, a tense encounter with an Native American Indian tribe, and a surprisingly dark attack on a snobbish hotel. However, these larger-set pieces play second fiddle to the taught character development and well-pitched emotional backbone of The Homesman. In capturing the bleak tragedies that lead to the mental illness of these three women, The Homesman manages to disturb and present the harrowing lives lived by those in pioneer times. However, this sense of gritty darkness is balanced with a hopeful progressiveness best showcased in the mindset of Mary Bee Cuddy. This proudly feminist character defies convention of the time as a single (albeit not by choice) woman of inspiring morals and understated strength, who stands-forward for this act of kindness when her male counterparts prepare excuses. Swank is astonishing in the role which proves to be the most emotive of her career. Although Cuddy is strong-willed and brave, the moments of human fragility that shine through in her performance touch the most - such as her continually rebuffed desire to find a husband, or a sequence which sees her leave the wagon behind to fix the unkempt grave of a deceased infant. Whether it be simply following the style of Glendon Swarthout's original novel or based on his own judgement, Jones makes some questionable narrative decisions. This is most notably seen in a misguided attempt to showcase a lighter side to Briggs in several scenes where he manically dances and sings folk ditties. This would perhaps have been less important if this was not how Jones chose to end the film - but in doing so it somewhat cheapens the quiet, lingering impact that The Homesman could have left us with otherwise. Fortunately Jones' generally restrained direction and acting talent ensures that these misguided decisions are forgiveable. With his expected sardonic humour and grumpy demeanour, Jones reveals an understated emotion in the film's final act which encapsulates how truly outstanding a talent that he is. 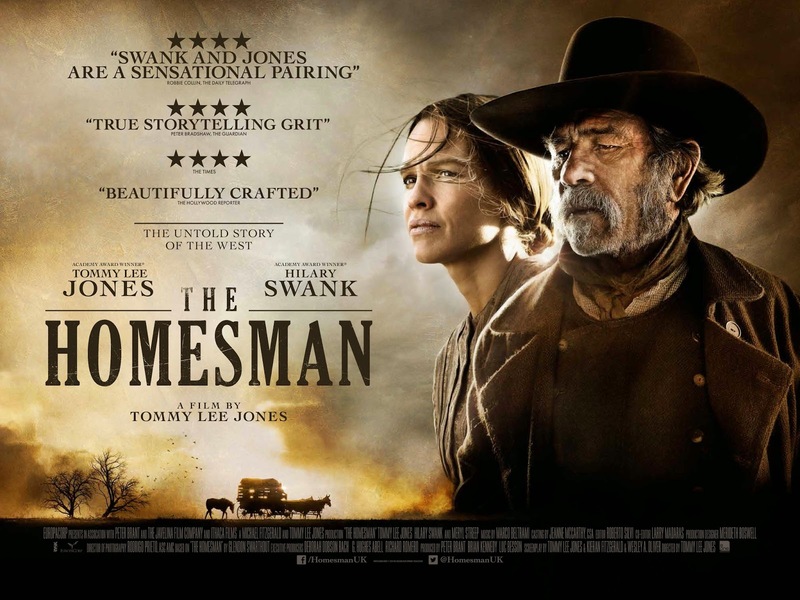 Bleak, yet highly captivating, The Homesman showcases Swank and Jones as two talents at their finest. With restrained direction, rich visuals, and well-pitched characters (none more so than Swank's Cuddy), The Homesman is one of the most impressive films of 2014.